On occasions something will cross your path that brings up memories of a place or places you used to frequent. I’ve been thinking a lot lately of Air Transport Command restaurant (or ATC for short), an establishment that my friends and I frequented very often in the 1980’s. From the DC-3 bomber that sat silently near the entrance, to the candle lite dinning room tables with headphones that let you listen to a nearby control tower, to bathrooms piped with period music and speeches (going to the bathroom while Winston Churchill told you that “this was their finest hour” – inspirational! ), ATC was determined to take you back into time, and indeed, back into history. But although the restaurant could have easily been passed by some as one of the many fad themed restaurants that are common place now a days, it always seemed to me to be more than that. Maybe because at that time, I hadn’t run into many theme restaurants. Your trip in the Wayback Machine started with the bridge, a construct over a drainage ditch that although sturdily constructed, was built in a fashion so that cross boards rattled with considerable noise as you drove across it. Shortly after your crossing, you were greeted by the old, single soldier guard shack with the black and white border gate. Luckily the gate was raised, no need to check IDs or papers here. Once parked, the temporal regression really began. You walked up a short path, past a sandbag bunker protecting a infantry cannon and passing under the brick archway on which was affixed a sign that read “Prestwick, Scotland”. A few short steps brought you into a courtyard that could have been easily used as a set in any WW2 movie, with era appropriate music emanating from hidden speakers. Walking into the heavy, counter weighted wooden door to the clarinet and saxophone harmonies of Glenn Miller, you really had a feeling that you had stepped back in time. Shirley Slade, WASP trainee on the cover of Life Magazine. Once inside, ATC did little to break the ambiance it had started to create. The foyer walls were covered in sandbags, the waitresses usually had on period uniforms, and the walls were covered with old photos of pilots and their planes, many of them women who used to fly the service routes in WW2. Oh sure, there were modern bar stations, a DJ booth, a 20 foot by 20 foot dance floor. But the adjoining seating area wasn’t filled with stale tables, chairs, and booths. No, the area contained couches and high back chairs that made your group feel that you were indeed sitting in a officer’s club. If the evening was nice, you’d probably want to go out onto the patio, a structure built in the fashion of a bombed out villa, complete with gas fire pits. If you and your friends closed your eyes, you could almost imagine the sound of planes taking off or landing. But the great thing about ATC was, you didn’t have to imagine. Built on the South West corner of the New Castle Airport, ATC’s porch gave you an excellent view of one of the airport’s runways that was only a couple hundred feet away. If you were lucky, you’d show up on an evening when corporate or private planes and jets were flying in and out of the airport (the airport has only accept commercial flights a few short times, one time being the now defunct Hooter’s Airways, but Frontier Airlines is schedule to resume commercial flights into the airport on July 1st), or when the Air National Guard pilots were doing touch and goes on the runway in C-130s or very rarely, when a local sporting event would bring in the likes of the Firestone, Metlife and Blockbuster blimps, only to have them all have to fly in and tether at the airport to ride out an approaching storm. Sadly, ATC didn’t last. It closed, opened again briefly, and then closed again. Finally the DC-3 that marked the entrance was removed and the restaurant was razed. Perhaps that’s why I miss it so much sometimes, like Chumbly’s in New York or Downtown Brewing in Wilmington, because it’s no longer there. I looked back in some old pictures I have, but could not find any of ATC, although I know I photographed there on several occasions. The internet was also sparse, but I was able to find this very nice collection of photos of ATC after it had closed over at a very nice blog called Roadside Wonders. So what has me thinking of ATC lately? Old Dominion’s Bomber series. This trio of beers would have been something ATC would have been proud to serve. A play off the term “bomber bottles”, the beer were originally sold in only 22oz bottles, and consisted of GiGi’s (a Farmhouse ale), Double D (imperial India pale ale) and Morning Glory (espresso stout). Since their introduction, they’ve been so well received that Old Dominion has released two of them in 12oz six-packs, and the third (GiGi’s) is being packaged in 12oz bottles to be put into a 12 bottle collection of the three called the “Pinup Pack”. What ties these beers in my mind to ATC are the labels. 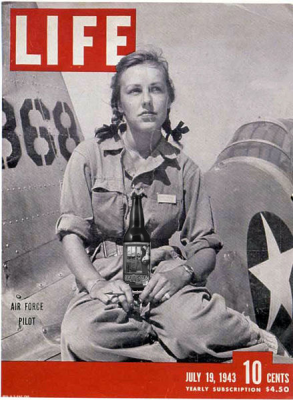 Old Dominion has creatively played off the term “bomber bottle”, and not only crafted a fine series of beers, but each one is adorned with artwork fashioned in the style of old World War 2 pinup girls that any fly boy would have been proud to have hanging next to their barrack’s cot or painted on the nose of their bomber. The beer I’m going to look at this time is the Morning Glory. It’s definitely the most intense and most interesting of the three. Would it do ATC proud? Let’s taste. THEM: The grain bill for Morning Glory consists of Chocolate, Crystal, Pale, Smoked, Wheat, and Roasted Malts; all of which is fermented until the beer reaches 9.0% ABV. Bravo and Glacier hops are used to balance out the beer at 35 IBUs. To get the “espresso” in this espresso stout, Old Dominion went local and tapped the folks at Espresso-n-Ice, in Dover to help them roast the 65lbs or coffee beans per batch that Morning Glory sits on for 13 days. ME: I think fans of “coffee stouts” will like this. I’m not even going into the head/color/carbonation – it’s a stout. ‘Nuff said. The nose is light and not overly complex, which is acceptable for a stout, with just enough coffee mingled in there to let you know what to expect if you didn’t see the label. As for the flavor, Morning Glory is surprisingly clean on the front end, there’s some malt, vanilla and chocolate tones to start you off, but soon the coffee comes through. With the word “espresso” on the label I was expecting something pretty strong, but it’s not to overpowering which for me, a self-confessed coffee non-lover, is actually welcomed. I’m working hard to pull out any “smoke” from the smoked malt they used, but I just can’t seem to do it. Maybe the beer is to cold (damn fridge) or maybe my palette is just off today. The finish isn’t overly bitter or harsh, in fact I found it quiet pleasant with just a touch of lingering roast. If I was a fan of iced coffee, this is how I”d like it to taste. 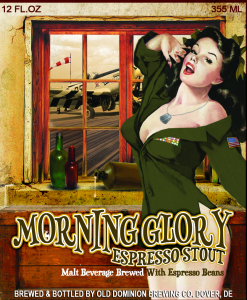 Morning Glory is pretty much as advertised, a straight forward coffee stout. It’s not as big and bold as some of the others out there, but it’s pretty darn drinkable the way it is. And as much as this kind of beer isn’t normally my cup of, well….coffee I guess, I still enjoyed it. It’s definitely a beer that has a place, and I guess depending on how much you like the taste of coffee will dictate how much of a place it has in your beer fridge. I think ATC would have approved. I do love me some coffee stouts. If they sell it out here, I’ll be sure to pick one up. And a nice story to go with the beer! I JUST saw these yesterday as I was popping in to a liquor store to pick up a six pack that would please me AND my father-in-law (went with the Sam Adams Noble Pils). I was of course intrigued by the labels (Va-Va-Voom!) and was curious to find out if they were any good. I didn’t buy them this time around, but now that I read your review, I will definitely pick up a bottle or two. Sounds delicious! As usual, great stuff! Well done Ed! Thanks. I find OD/Fordham very approachable. For the most part they’re not going to knock you off your bar stool, but sometimes you don’t want that. I had their Double D about a month ago. The tap handle was a woman who reminded me of Jessica Rabbit and after staring at her all night decided I need to taste what she had to offer. She was good, indeed. For a DIPA, she was surprisingly well balanced. LOL, you resisted all night? You’re a stronger man than I. But then again I always had a thing for Jessica Rabbit.